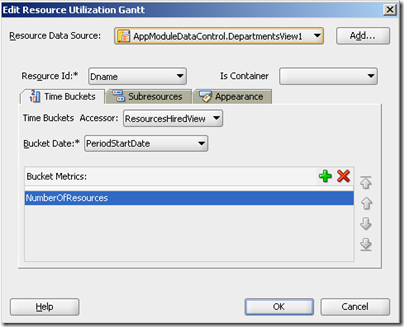 This article shows how this challenge can be addressed using ADF DVT – Data Visualization components, more specially the Resource Utilization Gantt Chart. It will describe how ADF BC is used in conjunction with the SQL TRUNC function and a smart bind parameter to allow for dynamic zooming to different time aggregation levels. And the approach demonstrated in this article can easily be reused for other time based presentations. The underlying database for this application will simply be good old tables DEPT and EMP. We only need to access to the tables in read only mode. 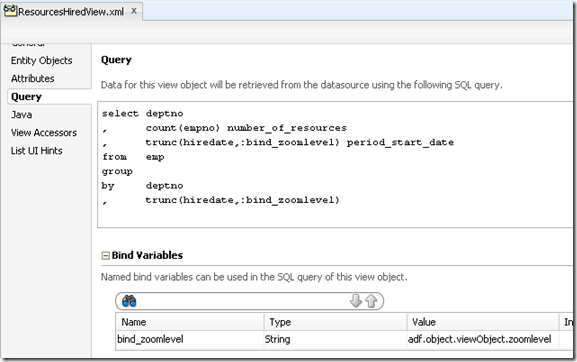 The SQL query we can use to aggregate by the the desired time period – Year, Quarter, Month – was introduced in this blog article https://technology.amis.nl/2013/02/16/using-trunc-in-sql-to-get-the-first-date-in-a-period/. 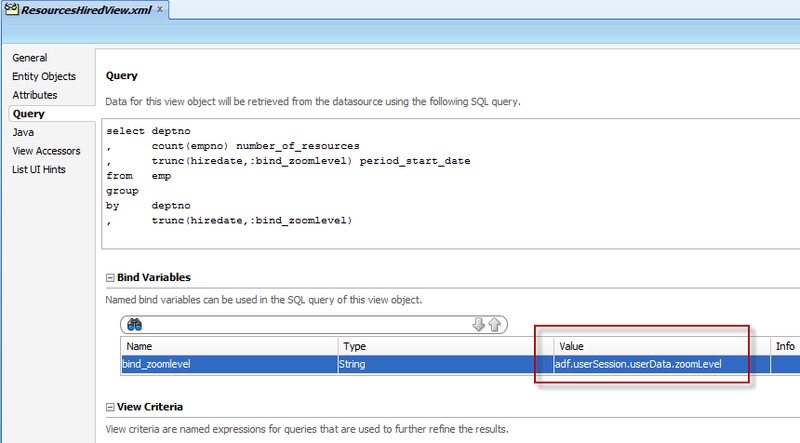 The key to this query is the use of the SQL operator TRUNC that will return the start of the period that contains the date that is fed in as the first parameter and that takes a YY, Q or MM format identifier as its second parameter. You will notice how this query does the aggregation at a time zoom level that is determined through the bind parameter bind_zoomlevel. This bind parameter is then defined to take its value from the Groovy expression adf.object.viewObject.zoomLevel. This refers to a getter method called getZoomLevel() defined in the ViewObjectImpl class created for the ResourcesHiredView ViewObject. We have a little bit of a special situation here: we want to use a bind parameter to influence the query in this ViewObject. However the page will only have a data binding for the DepartmentsView and it will access the result from this ResourcesHiredView via a View Link Accessor on the DepartmentsView. 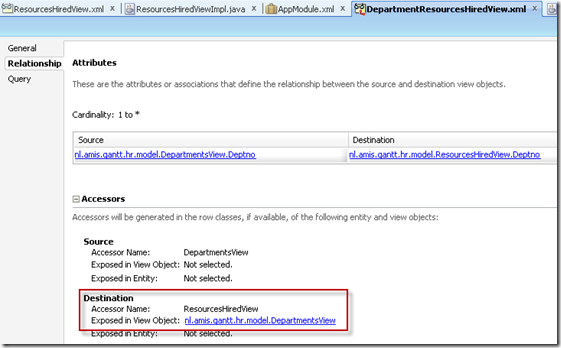 There is no binding for the ResourcesHiredView and therefore there is no direct access to the bind parameter on this ViewObject. I have designed a bit of a workaround to still be able to set a value from the page that will influence the query result from the ResourcesHiredView. I am open for suggestions as to how to approach this in a leaner, smarter and more elegant way. The Client Interface of the Application Module exposes the setZoomLevel method, which we will be using in the ViewController to actually manipulate the value of the bind parameter. 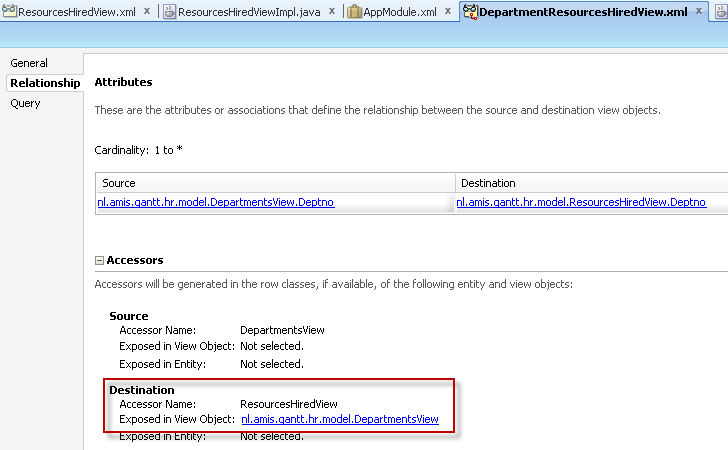 The last thing we need to do in the Model is to create a ViewLink from DepartmentsView to ResourcesHiredView and expose an accessor for that ViewLink in the DepartmentsView. At this point, we can test the Model project by running the AppModule and trying out whether the correct aggregation level is applied, depending on the value passed to the AppModule’s setZoomLevel method. Departments are the Resources with Dname the Resource Identifier. The ViewLink Accessor on the DepartmentsView is used to access the time buckets (the time related metrics). 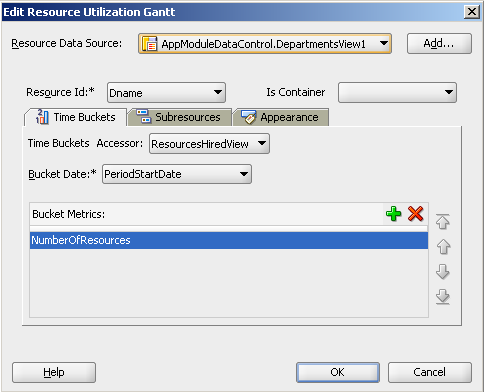 The one metric the time buckets contain in this case is the NumberOfResources attribute, a single numeric value. 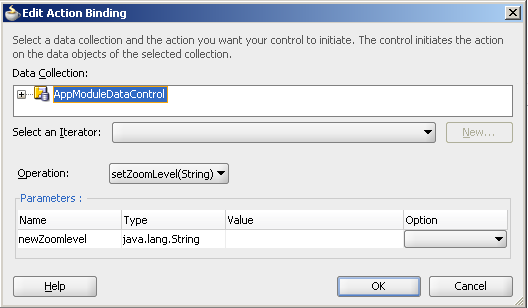 Note that whenever the handleZoomLevelChange method is called, the new value set for the zoom level is passed to the setZoomLevel method on the Application Module and thereby exposed as the underlying value for the bind parameter used in the query in ViewObject ResourcesHiredView. After that, the Gantt Chart gets refreshed – through the partial target refresh. 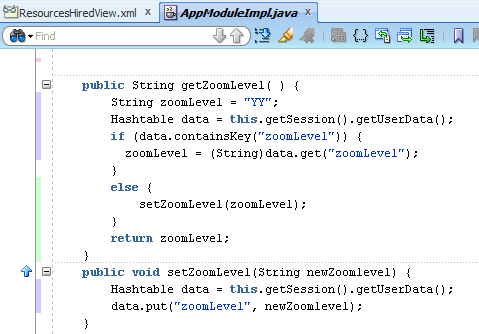 Also generate into this bean the accessor methods for the zoomLevel member variable. Each will return the currently desired level for the timescale axis. Now everything is in place and you can run the application. Download the JDeveloper 11gR1 11.1.1.6 Application that contains the sources discussed in this article: ZoomingResourceGanttChart.zip. Blog article introducing ADF DVT Gantt Charts: https://technology.amis.nl/2013/02/16/adf-dvt-speed-date-meeting-the-gantt-charts/. 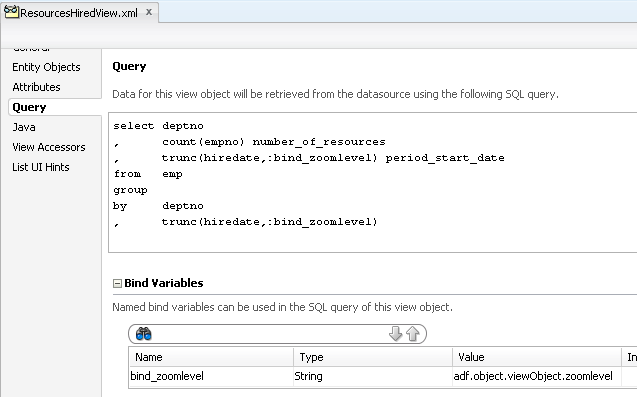 Blog article introducing the SQL TRUNC function for finding the first date of a period in which a date falls: https://technology.amis.nl/2013/02/16/using-trunc-in-sql-to-get-the-first-date-in-a-period/.